What does Hot Work mean? Hot work, i.e. working with the risk of fire, are works that generate sparks or utilise open fire, or another source of heat, thus causing a fire hazard. The fire risk work includes, among others, gas and electrical welding, work using a gas burner, thermal cutting, grinding. In the Scandinavia (Sweden, Finland, Norway and Denmark), these works require the possession of the Hot Work card. 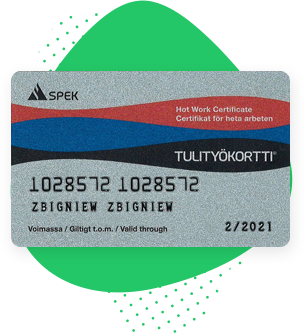 The Hot Work license certificate (Tulityökortti/Heta Arbeten) is issued in the form of a plastic card, which includes the logo of the examining body and is valid for 5 years. In Polish, the certificate is named "Hot Work Safety". The Hot Work card is required for executing hot work in Sweden, Finland, Norway and Denmark. Companies in the Scandinavia require their employees and subcontractors to have the Occupational Safety Card. This also regards Polish companies that execute contracts or projects in the Scandinavia. 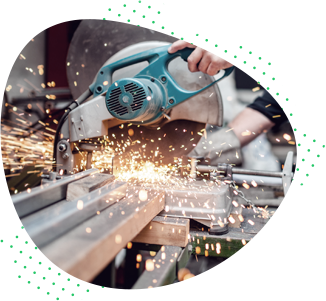 The Hot Work training course embraces notions concerning the safety, health and environment management system in workplaces according to the standards applicable in the Scandinavia: Finland, Sweden, Norway, Denmark. The Hot Work License certificate is intended both for directors and line employees. One-day training concluded with a theoretical and practical exam, available in Polish or English. Stationary training conducted in Polish or English, duration: 1 day / 8 hours (with breaks for coffee and meals). The purpose of the training is to get the employees and subcontractors acquainted with the regulations concerning working on high-risk stations, thus improving their awareness in terms of occupational safety.